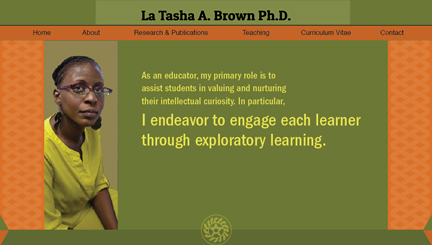 Problem: Ms. Brown was looking for a website to present her academic achievements in the field of Cultural Studies. She provided the text and images for the site, and we discussed the qualities that she wanted the pages to convey. Solution: The Sevenfold Studio translated these verbal qualities into visual terms. The result is a series of web pages that communicate in multiple ways.